The article demonstrates how different versions of the same service could be supported or not in a web API. Underneath are good links of different possibilities, which are better for different business scenarios. Depending on the client application/implementation, an update strategy could be implemented using Message Handlers. 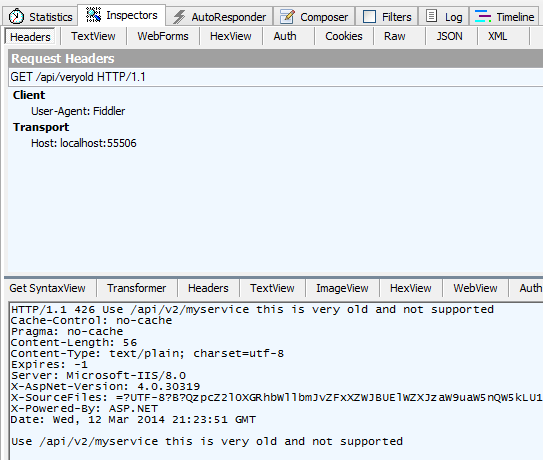 Possibility One: The old version of the service is supported but returns a HTTP 426 to inform the end client that the client must be updated. This could work well for closed systems, but never for public services as the HTTP status is not OK! To demonstrate this, 2 controllers need to be created. // with a 426 in a message handler but still receives content. The Web API config needs to be changed. The VersioningHandler is added. When the HTTP request is sent, the client receives a 426 with the correct old content. 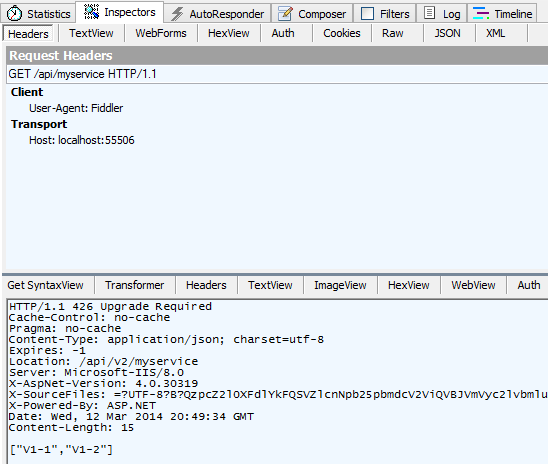 Only the URL with the old service should cause the above handler to be called. Add the Message Handler to the route config for the controller which does not exist anymore. When executed a 426 is returned but with no payload and no controller processing. Note: If you use this, you cannot use the default RoutePrefix Attribute. The IHttpActionResult implementation is used to set the headers of the responses. Different Headers are set depending on the version. Of course there are many others ways to support different versions of services in Web API. See the links below. This post just demonstrates some possibilities using Message Handlers or request header version handling.